Dental disease is extremely common in dogs and cats from a very young age. It’s not surprising when you consider that they are not cleaning their teeth twice a day! Here at the Oaks, we know that dental disease is a leading cause of heart, lung, kidney and liver damage. If your pet has stinky breath, manky molars or grim gums, or simply for advice on dental hygiene, please come down to see one of our nurses for a free dental consultation. We can show you how to brush, advise you of the foods that really make a difference or book your pet for dental treatment if required. 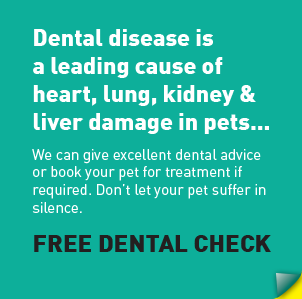 Your pet cannot tell you that their mouth is hurting so don’t let them suffer in silence- get a free dental check today.